Created by: Roger Stern, John Romita Jr. 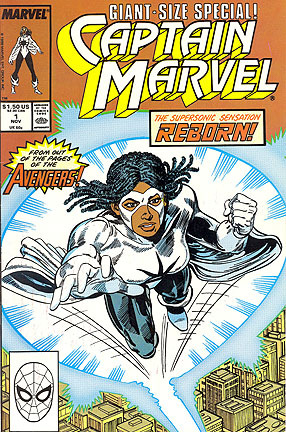 Origin: Bathed with rays from another dimention, New Orleans Harbor Patrol officer Monica Rambeau finds herself able to transform into electromagnetic energy. She joined the Avengers, working her way up from member-in-training to full member to chairperson. She lost her powers and position in a battle, but slowly regained them. After the appearance of Genis-Vell as Captain Marvel, she changer her superhero name to Photon. Later she changed it to Pulsar, and later still to Spectrum. All characters named herein are copyrighted by their respective copyright holders. This project is not sponsored or endorsed by the holders of any of these copyrights or the creators of any of these characters.